Iowa State’s poultry research program is home to the world’s oldest inbred research lines of chickens, a unique and invaluable resource for making improvements to poultry. 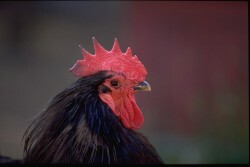 The chicken lines date as far back as 1925 and originate from many areas, including birds imported from Egypt and Spain. Arne Nordskog led the influential poultry science program for more than 40 years. He was succeeded in the 1980s by Susan Lamont, a Charles F. Curtiss Distinguished Professor of Agriculture and Life Sciences and an international leader in poultry genetics and avian immunogenetics. ISU’s research flock is a powerful tool for genetics research to improve disease resistance, growth and food safety. In the early 1900s, animal breeding was regarded as more of an art than a science. Jay Lush changed that. Lush is known as the father of modern scientific animal breeding and genetics. He advocated breeding not based on subjective appearance of the animal, but on quantitative statistics and genetic information. The idea was radical at the time because animal selections were based on how livestock looked in the show ring. Lush combined management practices, genetics and statistics to formulate a new scientific foundation for livestock improvement. From 1930 to 1966, Lush was a professor of animal science at Iowa State. In 1937, Lush authored the classic book “Animal Breeding Plans,” which greatly influenced animal breeding around the world. During his career, Iowa State attained a worldwide reputation of excellence in animal breeding and genetics. The Maytag Dairy Farms in Newton, Iowa, started in the early 1900s. Fred and Robert Maytag inherited the farm from their father and looked for ways to produce more than milk from their herd of Holsteins. Fred approached Iowa State’s dairy science department, where food chemists were working on a recipe for Roquefort cheese made from cow milk rather than sheep milk. Fred offered to build the cheese plant and pay royalties to Iowa State in return for the opportunity to create an American blue cheese. In 1937, Experiment Station dairy microbiologists Clarence Lane and Bernard Hammer developed the process for making blue cheese using homogenized milk. The Lane and Hammer process became the standard for the blue cheese industry, and was first used by Maytag. The patent for the blue cheese process developed by Lane and Hammer netted $201,366 for the Experiment Station. In the 1950s, when there was widespread interest in developing a “meat-type” hog, Lanoy Hazel, a professor of animal breeding, was instrumental in two major developments that spurred this trend — the backfat meat probe and central swine testing stations. The probe was a thin, metal ruler that measured the fat thickness of a live hog when inserted through a small incision in the hog’s hide. Its blunt end could not penetrate muscle, thus providing a quick and accurate measurement of the body fat layer. The first Iowa test stations for identifying meatier, faster-growing hogs began near the Iowa State campus. In the early 1950s, distinguished animal science professor Wise Burroughs developed diethylstilbestrol, a synthetic estrogen as an additive in cattle feed that stimulated animal growth. At its height, two-thirds of the nation’s cattle producers used the product to enhance profitability through improved animal growth and efficiency, and saving Iowa farmers about $16 million in feed costs annually. Burroughs’ work introduced the concept that it was possible to increase animal performance by focusing on the endocrine system. Richard Willham, a professor in animal science, came to Iowa State in 1966 and is known for many contributions to beef cattle breeding. He is recognized as a major force behind the development of national sire evaluation and national cattle evaluation programs. He developed the Computer Cowgame, a tool for teaching principles of selection using performance records. Breeders and commercial producers played the game, gaining a better understanding of genetic principles and selection practices. The game continues to be used in animal-breeding classes worldwide. Lauren Christian, distinguished animal scientist, became known throughout the world for his work in swine genetics, pork quality and the many students who continue his work. He was the first to characterize porcine stress syndrome (PSS), find its cause and develop techniques for identifying afflicted and carrier pigs. He also developed the halothane-screening test, universally recognized as the most accurate PSS screening test for decades. A delivery of 47 young Chinese pigs arrived at Iowa State in July 1989, marking the end of a 10-year effort by researchers to bring the hogs to the Midwest. A second delivery of Chinese pigs arrived in December, when the first of the imported pigs gave birth. A Meishan gilt farrowed Dec. 1, the first time a litter of purebred Chinese pigs was born in the United States. 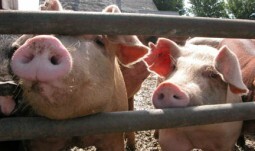 The pigs were used for studies of immune response, disease resistance, growth, feeding and carcass quality. Iowa State became the first university to build and operate a linear accelerator in 1993. The electron beam linear accelerator was used for food irradiation research and demonstrations. Researchers studied the amount of irradiation needed to extend food shelf-life, reduce spoilage organisms and eliminate pathogenic bacteria, parasites and viruses in foods. Juven, a nutritional supplement that restores and maintains muscle mass, hit the market in 1998. The nonprescription drink mix, developed by animal scientist Steve Nissen, is intended for use by people with AIDS or muscular dystrophy, the elderly and others suffering from muscle loss or “wasting.” The key ingredient in Juven is a compound produced in the human body. Nissen was studying its potential as a livestock feed additive when he realized the product’s potential for humans. Unlike anabolic steroids or human growth hormones, which also are effective against wasting, Juven has no demonstrated side effects and costs less than other options. The use of three genetic tests in developing superior pigs for improved litter size is the first use of DNA tests to improve reproductive traits in domestic animals. Max Rothschild, distinguished professor of animal science, invented the tests with students and colleagues. Rothschild’s ESR gene test allows direct selection of individual females and can be applied before the animals reproduce. In addition, it allows for selecting males who will pass on the desired form of the ESR gene to their female offspring. The two other genetic tests, the PRLR gene marker and the RBP4 gene marker, also were invented to improve litter size. In 1999, Rothschild received an R and D 100 Award for the ESR gene test. In 2002, the Iowa Intellectual Property Law Association named him Inventor of the Year. A simple laboratory test was developed at Iowa State in 2001 that results in leaner pork for consumers, higher profits for producers and a positive impact on the environment. Max Rothschild, distinguished professor of animal science, and graduate student Kwan Suk Kim, developed the PT1 gene test based on a naturally occurring mutation in the MC4R gene. The favorable form of the gene is expressed as a lower appetite in the animal, which translates into less fat accumulation and a better conversion of feed consumed into lean meat. The PT1 gene test for pig appetite regulation earned an R and D 100 Award in 2002. An Iowa State study in 2002 was the first to show how endocrine cells release hormones in the body. Lloyd Anderson, an emeritus professor of animal science, and his colleagues studied how the release of hormones in animals of agricultural importance can lead to greater efficiency of growth and meat quality. Research and discovery in cell secretion has a profound impact on our understanding of the cell, and on animal and human health and disease. The legacy of a California man, who authored 22 animal science textbooks, is being carried on by faculty at Iowa State. Marion Ensminger had a lifelong dedication to animal agriculture education. In 1964, he organized Agriservices Foundation and launched a series of technical agriculture seminars held in more than 70 countries. A bond between Ensminger and Iowa State began in 1990 when Ensminger contacted David Topel, then dean of the College of Agriculture, to ask if the college would help develop a series of seminars for Russia. Topel worked with Ensminger on other programs in Ukraine, Cuba and China. Through these contacts, Ensminger asked if Iowa State’s animal science department would take over his textbooks. An agreement was reached and Ensminger’s books became the responsibility of Iowa State at his death in 1998. 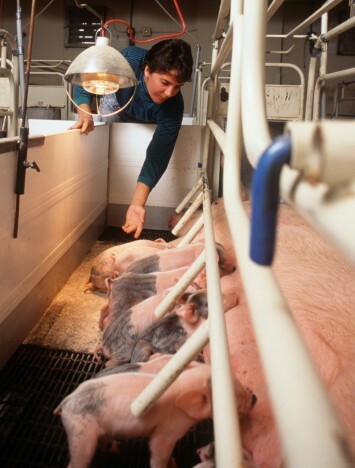 Genetic markers for growth, leanness and meat quality discovered at Iowa State were made available to pork producers in the United States in 2007. The ISU Research Foundation signed a licensing agreement with GeneSeek Inc. of Lincoln, Neb. The license permits GeneSeek to use the technologies as markers to identify hogs that have the potential to improve economics of hog producers operations’ and enhance pork quality for the consumer. Research led by Matthew Ellinwood, a veterinarian and animal science professor at Iowa State, offers hope for children born with a rare genetic disease. The research focused on a disorder called mucopolysaccharidosis type 1 which is caused by the lack of a key enzyme that breaks down substances the body needs to help build normal nerves, bone, cartilage, tendons, corneas, skin and connective tissue. The 2010 study demonstrated that beginning replacement of the enzyme shortly after birth prevented irreversible damage caused by the disease. Hank Harris, professor of animal science and veterinary diagnostic and production animal medicine at Iowa State, has been translating his research on emerging livestock diseases into products that are meeting the needs of Iowa’s $10 billion animal agriculture industry. His Iowa-based company, Harrisvaccines, focuses on improving animal health in the cattle, swine and farmed shrimp using advanced molecular science techniques. The company developed and marketed a much-needed swine influenza vaccine shortly after the discovery that a pandemic influenza in people had spread into the pig population. Another example is an innovative vaccine for Porcine Reproductive and Respiratory Syndrome Virus.